Amy Monkiewicz and Caleb Dubofsky (Grade 4 teachers) have been developing a new student exploratory learning project called the Grade 4 Map Museum Project. The year began with students learning more about the places they visited over the summer. Students studied features of maps and developed a deeper understanding of how cartographers use these features to create maps. Their studies included field trips to the Boston Public Library where they visited the Norman B. Leventhal Map Center. This center is the holding place for maps dating back to the 15th century to the present. 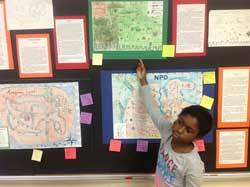 Students synthesized all of their learning into their personal map project. A concluding event celebrating their work was held on Thursday, November 6, 2014. Grade 4 will continue their studies by focusing on the five regions of North America in the 1600’s. They will understand how geography impacted the lives of different tribes. Students will create research books connected to this study. The Discovering Justice Curriculum will be a resource for their continued work. The student’s studies will extend to the present day with the regions of the US. Integrated with this understanding of Native Americans is a literacy project. Students read many legends and wrote a legend of their own. Map work will also be an important part of this study and students will explore the essential question: How does where we live influence our lives? Students will be engaged in this topic up until the end of January or mid February. The next huge topic of study is immigration. Students will learn more about who came to America and what were their experiences. Family support is a crucial ingredient. Grade 4 parents can support classroom learning by sharing information about their family’s journey to America with their child(ren). This will support his/her learning in the class and is one way for every family to participate. Please contact your child’s teacher to learn about more ways parents can be supportive.